Violinist, Trisha McGovern, is new to Little Rock, Arkansas. 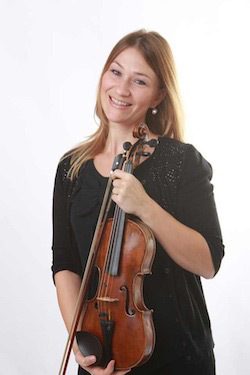 A native of Kansas City, Dr. McGovern recently completed her Doctor of Musical Arts degree in Violin Performance at the University of Missouri-Kansas City Conservatory of Music & Dance where she studied Violin Performance with Benny Kim. She also holds Bachelor of Music and Master of Music degrees from the San Francisco Conservatory of Music where she studied Violin Performance with Ian Swensen and chamber music with Mark Sokol. While a student at UMKC, she was awarded a fellowship with the Graduate Fellowship String Quartet and performed with that group for three years under the direction of Carter Enyeart. She maintains an active and varied career as an orchestral musician, solo recitalist, chamber player, and teacher, with performing and teaching experience throughout the Kansas City metropolitan area, Des Moines, Iowa, Wichita, Kansas, Saint Joseph, Missouri, and the San Francisco Bay Area. She was recently appointed Assistant Concertmaster with the Saint Joseph Symphony, a Tenure Violin Position with the Des Moines Symphony, and a Tenure Violin Position with the Wichita Symphony Orchestra all in the same year upon graduating. Her most recent concert engagements include performances with the Arkansas Symphony Orchestra, Des Moines Symphony, Wichita Symphony, Saint Joseph Symphony, Kansas City Ballet, Civic Opera Theatre of Kansas City, Monterey Symphony, Marin Symphony, Oakland/East-Bay Symphony, Santa Rosa Symphony, Sacramento Philharmonic and the Oakland Opera Theatre. She was a finalist in the 2005 auditions for the New World Symphony in Miami, Florida and has enjoyed subbing with the orchestra. Dr. McGovern has also studied with Noah Geller, Concertmaster of the Kansas City Symphony, and Catherine Van Hoesen of the San Francisco Symphony and has performed in violin master classes of Charles Castleman, Brian Lewis, and Ellen Jewett, and chamber master classes with Sadao Harado, Robert Mann, Jorja Fleezanis, and Mack McCray, as well as the Parker, Ying, Formosa and St. Lawrence String Quartets.